Though Costa Rica had its own version of slavery from approximately 1502 to 1824, there was never a fully viable cash crop plantation system – that is, outside of the small spike in cacao production between 1690-1740, which saw the largest influx of slaves in Costa Rica. For the most part, African slaves were focused on domestic labor, many of them working alongside Spanish colonialists. This form of slavery was very different from other New World slave societies. African slaves in Costa Rica worked in three areas: some on the cattle ranches of Nicoya, some on the cacao plantations of Matina, and most in domestic servitude in colonial Cartago. Since colonial Costa Rica did not directly import Africans from West Africa, most of the slaves were brought into the country via Panama – Portobello was a major slave auction site – and along the coasts through smuggling and small purchases. Most enslaved Africans entered Costa Rica in small numbers and were quickly absorbed into the primary labor force. With such minimal and inconsistent numbers, most Africans in Costa Rica were already “American” by the 16th century through one generation of mixing with indigenous and Spanish populations. Economically, most Spaniards could not afford to sustain slaves as they struggled to maintain their own livelihoods. As a result, many Africans were freed, purchased their own freedom, or lived fairly autonomously in the outlying cacao plantations with owners who showed up once a year. By 1709, money was so scare that colonists used the cacao bean as currency (check out the Museo de Oro Precolombino in the Plaza de la Cultura in downtown San José for a history of Costa Rican currency, including cacao beans). Cacao held its weight as the currency for the purchase of slaves. 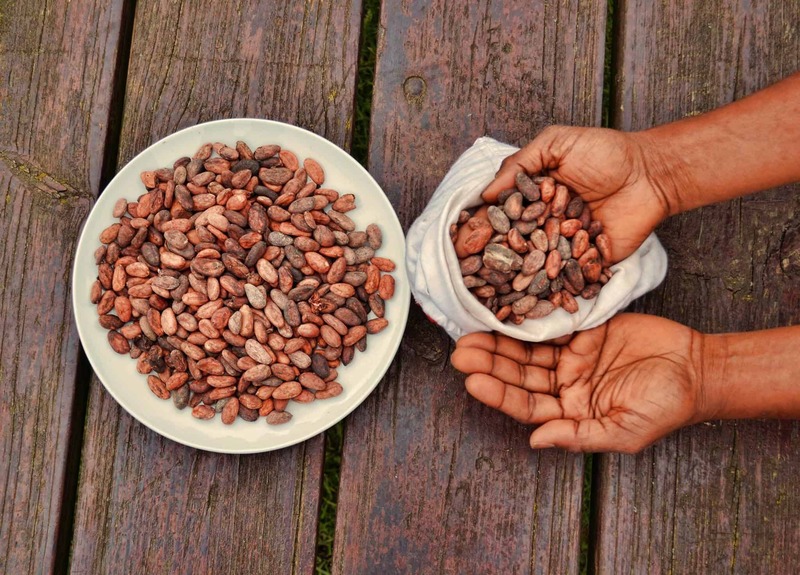 For example, in 1761, the 8-year-old child of the slave Juana Josefa, owned by Feliciana Calvo, was sold to a Cartago priest for 150 pesos in cacao. Slaves who had access to cacao had unique bargaining power, and by the 18th century there was a large population of free Blacks, many of them lived in the designated “township” of Puebla de Los Pardos (pardo meaning “free black”) right outside of Cartago. It is a researcher’s dream to come across the actual voices of enslaved people in historical archives; usually slaves are lumped into statistics without names, and their narratives are told from the perspective of the founding fathers. As I was combing through records on this time period at the Costa Rican National Archives, I kept seeing names and testimonies from enslaved Africans, but I could not figure out why. Finally, I stumbled across Voyage 35157 of the Christianus Quintus and Voyage 35158 of the Fredericus Quartus, two Dutch slave ships that reportedly crashed along Costa Rica’s Caribbean coastline near Cahuita in March 1710. According to maritime records, the Christianus had begun its purchase of Africans along the West African coast in April 1709, stopping at the Dutch slave ports Christiansborg, Whydah, Gold Coast and Bight of Benin. It eventually left Africa on September 28, 1709 with a total of 373 Africans, 318 of whom would eventually survive the Middle Passage, as the transatlantic slave voyage across the Atlantic to the Caribbean and Latin America was known. The Dutch captains were Hans Hansen Maas and Andres Waeroe. The other ship, the Fredericus, had sailed from Copenhagen to West Africa, purchasing Africans on the Ivory and Gold Coasts as well as Benin, Christiansborg and Keta. It left the West African coast on October 2, 1709 after it successfully put down a slave revolt on the ship on September 15, 1709. Both Dutch ships were originally bound for the Island of St. Thomas. However, according to African testimony, a massive storm caused both ships to veer off course and crash near Cahuita on March 2, 1710. What is most amazing about this story is that there were approximately 690 Africans who survived along with the Dutch crew. The stories are corroborated because the Dutch sailors managed to get on a ship heading to Portobello, Panama and were able to return home and narrate their stories to the law courts in order to gain the necessary insurance payment from investors for lost human cargo. However, they left the Africans behind on Costa Rica’s Caribbean coast. These were predominately from the Western Yoruba subgroup of Nago. In the slave trading world, the language designating those of Yoruba origin also used Casta Lucumi, Mina, Arara, Ana and Nangu – words found in the archives. According to the records from the seat of the Catholic Church, which was in Guatemala, about 100 of the Africans abandoned onshore by the Dutch captains were captured and hidden by several Spaniards and taken to work on their cacao plantations, away from the eyes of those who may have taxed them for owning slaves. In the Catholic Church’s records, there are several testimonies by those captured Africans who were interviewed by a slave named Francisco (Casta Arara) who served as an interpreter. They recounted the story of a great storm that shipwrecked their boats and the experience of being captured by the Spaniards who enslaved them. The other 540 Africans simply “disappeared” into the bush, and we can assume that they created the foundation of some of the earliest AfroCosta Ricans on the Caribbean coast. It is a gift to be able to call the names of Africans who lived and labored in Costa Rica during the 18th century. Calling their names – sadly, their Spanish colonial names, not their true names lovingly uttered by their mothers in Africa – means they existed. Their lives mattered. They added to the development of Costa Rica. And I call: Maria and Petrona(Casta Nangu). Juan (caught by slavers Gasper de Acosta Arevalo and Juan Bautista de Retana). Augustina (Yoruba Casta Ana, also captured by Retana). Nicolas, Miguel, Felipe Cubero (from Congo). Antonia Cinitola (from Congo). Micaela (Yoruba Casta Ana). Miguel Largo (Casta Mina from the upper West African slave coast). They, among others, survived the slave pens of West Africa and the horrific crossing of the Atlantic. They labored, loved, and died in Costa Rica – some gaining freedom, like Augustina, who was the first enslaved woman to appear in the Church register because she married Antonio García on May 3, 1733. They were both slaves of don Juan Francisco de Ibarra. I can only imagine the lives of those Africans who had to begin again in the Americas, washed ashore and quickly captured, yet these stories are more commonplace in the narratives of the Transatlantic slave trade. I am most interested in those Africans who got away, escaping into the Caribbean landscape and finding their own path. How does Costa Rica claim them in their national lineage?